Proud cougars join in solidarity to walk in CSUSM’s annual Pride Walk on Apr. 3. “Stop the hate, love is love. Stop the hate, love is love,” chanted the marchers of CSUSM’s annual Pride Walk, hosted by the Pride Center. The event started at 11:30 a.m. outside of the University Student Union (USU) with sign-in sheets and information tables lined up front. 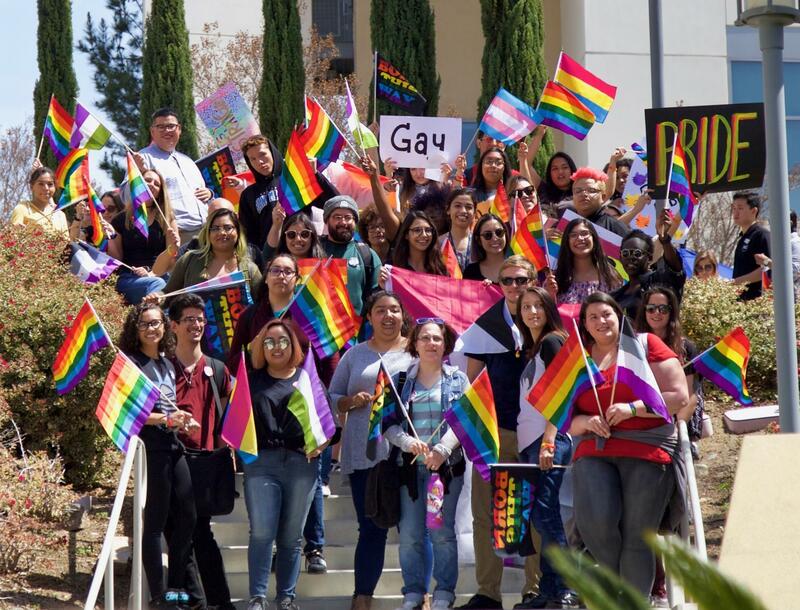 The latest edition of the “Feminist Agenda,” the 2017 edition of “Queery” and pride gear, such as CSUSM community march for LGBTQA+ pride bracelets and buttons, were available to take. The “Feminist Agenda” is the Gender Equity Center’s student-created, edited and published magazine showcasing work from a spectrum of perspectives, experiences and identities. The Pride Center’s magazine, “Queery” shows the artistic work of members of the queer community and allies. The Pride Center encouraged marchers to wave flags; each flag representing a different community and/or identity in the LGBTQA+. Posters were also made prior to the event. Master of ceremonies (MC) Mars Waddy and co-MC’s Fernanda Hernandez and Danni Morel represented every community and identity by acknowledging them before the march began. Waddy and Hernandez led the march through Forum and Kellogg Plaza and towards Craven Hall. Photos of the event were taken throughout, and marchers could participate in a group photo on the steps between Craven Hall and Academic Hall. The march was led through Markstein Hall, Palm Court, University Hall and Gonzalez Grove, all the way to the Arts Building where they stopped to take photos. For more information on the Pride Center visit the center in USU 3100 or their website; https://www.csusm.edu/asi/pride/index.html.